The $500 (as of April 2, 2012) HP LaserJet Pro 400 M451dn color laser printer produces extremely nice output--including photos--and is very speedy for a model in this price range. It also has an automatic duplexer, a feature missing from the $450 LaserJet Pro 400 M451nw that we recently reviewed. It sounds great--until you examine the toner costs, which are steep for a relatively high-volume printer. The controls on the M451dn are minimal but adequate. A two-way rocker button lets you navigate the two-line LED; the panel also has a warning light, along with the usual OK, cancel, and back buttons. Software installation is easy via either USB or ethernet, and the printer dialog procedure is well thought-out. Paper-handling features include a 250-sheet bottom main tray, an automatic duplexer, a 150-sheet output tray, and an optional ($143) bottom-mounted, 250-sheet auxiliary paper feeder. With a monthly duty cycle of 40,000 pages and a recommended actual monthly print volume of up to 2000 pages, the M451dn can handle a fair amount of printing. In terms of access, the M451dn is extremely well designed. From the front you can fold out a small part of the panel to reveal the 50-sheet front multipurpose tray, or you can move a larger part of the panel to access the paper path and the slide-out toner tray. A pop-off panel on the right side of the printer makes it easy to upgrade the standard 128MB of memory to 384MB. Note: As of this writing, HP's website sells a 256MB DDR2 DIMM memory upgrade for $599. That exorbitant price comes with HP’s guarantee that the memory will work in the printer, but third-party memory is available for less than $30. That brings me to the Achilles' heel of this printer: toner costs. The standard black toner cartridge costs $79 and lasts 2200 pages, or 3.6 cents per page. A high-yield black cartridge, available for $102, lasts for 4000 pages, reducing black costs to 2.5 cents per page. 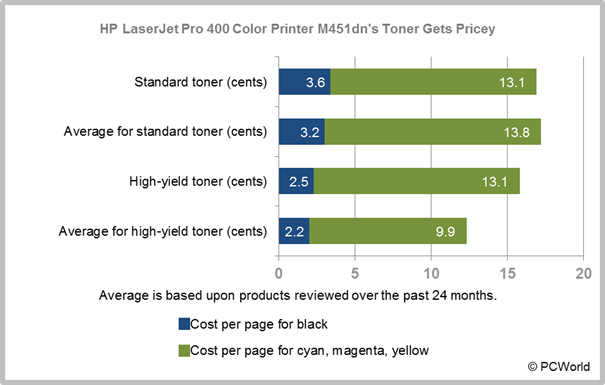 The costs are a little higher than average compared with those of other color lasers we’ve tested--and incidentally, some business inkjets have significantly cheaper consumables. HP offers no high-yield option for the M451dn's cyan, magenta, and yellow cartridges, so if you print a lot of color pages, this is not the printer for you. The standard sizes cost $114 each and last for 2600 pages, working out to just under 4.4 cents per page per color. Next to other standard-size cartridges, these costs are a little cheaper than average, but compared with high-yield toners, they are far more expensive than average. The starter-size cartridges that ship with the printer last approximately 1400 pages. If you can hack the toner costs, the output of the M451dn is impressive and arrives quickly. Text is dark and sharp, and color photos are very good for a color laser at this price. Our full-page test photo showed a cool color palette and nice details. Text pages rendered at 11.4 pages per minute on the PC and 11.0 ppm on the Mac. Normal-size photos printed at 3.2 ppm to plain paper and 1.5 ppm on glossy paper. Full-page photos printed at about 0.8 ppm. Output quality and speed are the HP LaserJet Pro 400 Color Printer M451dn's strong suits. If you need the Wi-Fi connectivity that it lacks, its otherwise identical cousin, the M451dw, is only $50 more, at $550. However, if you print in any sort of volume, the ongoing costs for any model in the M451 product line will hurt you eventually--especially if you print lots of color. Alternatives in this price range include the Dell 2150cdn and Brother HL-4570CDW; the latter's high-yield supplies are much less expensive than the M451dn's. Tuned for speed and attractive output, this small-office printer sings--but it hits a sour note with high-priced toner and absurdly expensive memory.